Numerus Clausus I is a gourmet / formal restaurant offering Mediterranean cuisine. The average price of a main course dish at the Numerus Clausus I restaurant is 15 euros. The average price of a 3-course meal at the Numerus Clausus I restaurant is 25 euros. Note that although GoMadrid.com strives to maintain all information about Numerus Clausus I up to date, the prices mentioned are only an indication and may not reflect the exact value of your meal. Just a few yards from Barajas terminals 1, 2 and 3, with free shuttle service to and from the airport, this restaurant is a magnificent option for dining (daily specials and à la carte) while you wait for your flight. 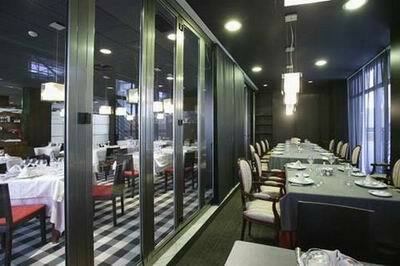 The address of the Numerus Clausus I restaurant is: C/Galeon, 25, Hotel High Tech Aeropuerto, 28042 Madrid. The nearest Metro station is Alameda de Osuna. Please see the Numerus Clausus I restaurant location map below.